Summer is a good time to cook with leftovers. When the weather is hot and the days are long and activity-filled, it’s nice to have a dinner that is quick and easy to prepare with a protein that has already been cooked. If we grill steak during the summer, we often grill an extra one or make sure they are big enough that we will have plenty left over for steak salad. A pork tenderloin easily creates two separate meals — the first one maybe grilled and served with pico de gallo; and for the second meal we might make pork fried rice. We also love to cook a whole chicken (either roasting it or grilling it, beer-can-style) on the weekend, then transform the leftovers into any number of second dishes, from casserole to salad to pasta. When we recently had some leftover chicken, we consulted one of our go-to quick and easy cookbooks (they have an entire chapter called “Starting with Leftovers”), “The Best 30-Minute Recipe” for a new way to transform cooked chicken. 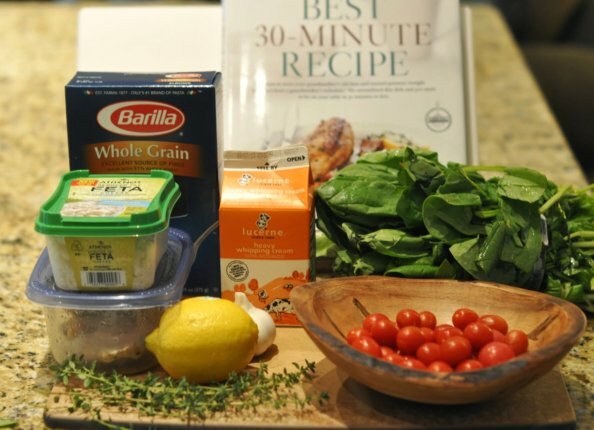 We added kalamata olives to further enhance the Mediterranean flavors from the fresh oregano, feta cheese sauce and tomatoes, and liked how combining the chicken, pasta and spinach made for a single-bowl, square-meal dinner. And with minimal effort involved (cutting up the chicken, blending the sauce ingredients and boiling the pasta), it’s an ideal way to end a hot and lazy summer day. Start by boiling the salted water and cooking the pasta (about a cup) until barely al dente (the pasta will cook for a few more minutes as the dish comes together.) We used elbow pasta because that’s what we had on hand, but the original recipe calls for penne, oreccheitte or farfalle pasta. Any pasta with a shape that will hold the sauce will work. While the pasta cooks, puree or blend the sauce ingredients until smooth: 1/2 cup crumbled feta cheese, 1/2 cup heavy cream, 1 tablespoon lemon juice, 1 teaspoon minced fresh oregano, 1/4 teaspoon salt and 1/8 teaspoon pepper, adding a tablespoon of water at a time as needed to loosen the ingredients and facilitate blending. We ended up adding about 4-5 tablespoons of water by the time the sauce was fully blended and smooth. Drain the pasta and reserve some of the cooking water to add later if the finished dish is too dry. Chop about a cup worth of cooked chicken. Return the pasta to the pot, then add the sauce, chicken, olives and tomatoes, bring the mixture to a simmer and cook until the chicken is heated through and the tomatoes begin to soften — about 3-5 minutes. Off the heat, add the spinach, stir it all together and let it sit for a minute until the spinach begins to wilt. Serve the pasta in low bowls, perhaps with some crusty bread and a nice Rosé wine. Then go do some star-gazing, have a night swim, catch fireflies, make a bonfire for s’mores, stay indoors to watch a movie in the air conditioning, or do whatever you do to make the most of your summer evenings.